Wanderlust (n): a strong desire or urge to wander or travel and explore the world. As I sit writing this initial blog post on the beach here in San Diego, California, I find myself reminiscent of the summer of 2012, the “summer of ships”, as I referred to it. In June of 2012, I was preparing for adventures of a lifetime, for I would be on board not one but two ships throughout that summer. The first, the mighty Oregon II, one of NOAA’s fishery vessels, conducting research in the Gulf of Mexico. The second, a luxurious cruise ship, sailing the waters of Alaska. Little did I know I would be sitting here, 3 years later, eagerly anticipating my voyage back to Alaska yet again on board one of NOAA’s fishery vessels, again as a Teacher at Sea. My name is Andrea Schmuttermair, and I am currently an elementary teacher at the Colorado STEM Academy just north of Denver, Colorado. I just finished my 11th year teaching, and I have had the privilege to teach some amazing students in Germany, California, and Colorado. I have a lot of fun with my students (like 3D printing sharks and coding our own reaction timer), and strive to give them as many engaging science experiences as I can. Outside of the classroom, you can find me creating opportunities for new adventures and experiences through travel and the outdoors. I love to hike and backpack the trails in Colorado with my faithful companion, Wesson. Traveling to new, uncharted territory is also a frequent occurrence. 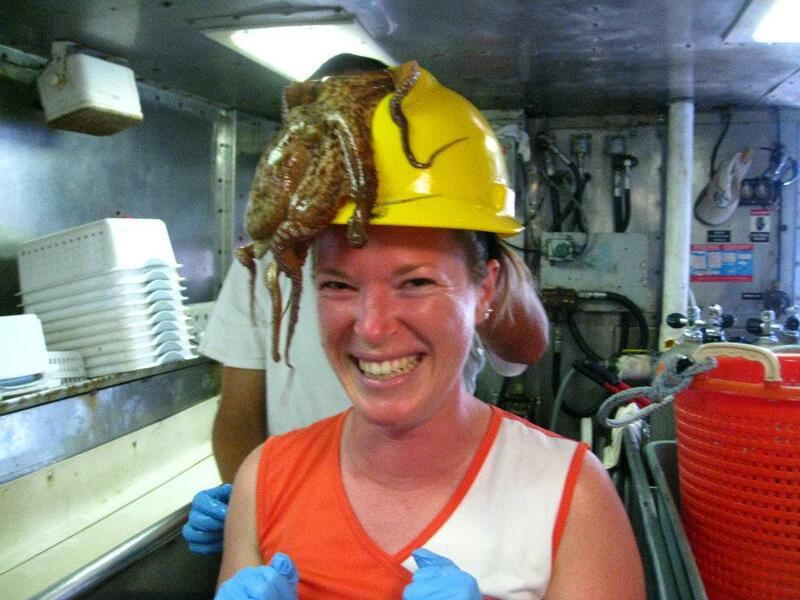 I first learned about the Teacher at Sea program back in 2008, and it immediately went on my bucket list. After a couple years of applying, I was accepted as a TAS in 2012 and helped scientists conduct the SEAMAP Summer Groundfish Survey in the Gulf of Mexico. To say I enjoyed it would be an understatement. It was by far one of the best experiences I have had, so much so, that when given the option to reapply, I knew I just had to. I am thrilled to be heading back to Alaska, this time wearing a different hat, to help scientists conduct the walleye pollock survey. The Walleye pollock is a key species in one of the largest fishing industries in the world. I am looking forward to helping scientists with this important research. My students spent the last several months of school immersed in the fascinating world of the ocean. Being in a landlocked state, the ocean was still relatively undiscovered for them, yet it drew my students in with a desire and passion I couldn’t feed quick enough. From engaging in problem/project based learning to studying ocean animals and their adaptations to skyping with our favorite shark scientist, Dr. Mikki, to creating 3D printed models of new ocean discoveries, I knew my students had found a niche and a passion for learning. They weren’t done yet though. After some brainstorming, we decided to spend the last month of school on an in-depth project learning about and building our very own underwater ROVs. Inspired by NOAA and James Cameron’s recent film, our class learned about how ROVs are built and how they are used in research in the ocean. Very fascinating! We ended our year building 5 ROVs, which culminated in a competition running them through various challenges. The winning ROV, the Waverunner, is coming with me on this trip to swim through the Alaskan waters off the shore in Kodiak. How cool is that?! I am counting down the days until I head out to sea. Stay tuned for my next entry on board the mighty Oscar Dyson! Did you know…that the scientific name for the Walleye Pollock was recently changed? After extensive genetic studies, researchers decided to change the scientific name from Theragra chalcogramma to Gadus chalcogrammus. Read more about it here. Do you…have any questions about the research being done on Walleye pollock? Leave your questions in the comments below! This entry was posted in 2015, Andrea Schmuttermair 2015, NOAA Fisheries Service, NOAA Teacher at Sea and tagged Alaska, Kodiak, NOAA, NOAA Ship Oregon II, NOAA Ship Oscar Dyson, ROV, STEM, Walleye Pollock Survey. Bookmark the permalink.